Wherever you go, whatever you do... break well! ...for a break! Yes, when the leaves are changing color, you know that it is time for a break...Fall Break. 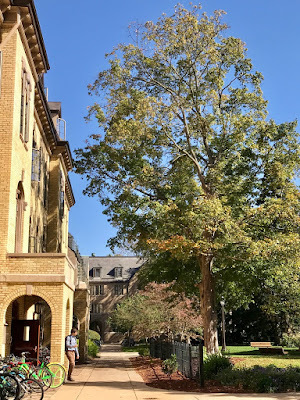 Thanks to the tall sugar maple tree in St. Edward's Park and the changing color of it's leaves, Stedsmen always know when it is time evacuate from campus. On the start of break, Jimmy White V '13, Steds AR and MTS graduate student, was walking out of the Hall and said, "The serenity of campus during these days of break had me wondering at first if I missed the rapture, but, alas, the Gentlemen have just (momentarily) left for other pastures. They will indeed be back since the grass is always greener on the other side of Fall Break: because on the other side is St. Edward's Hall!"